I stayed in nearby Brescia and visited Verona on a day trip. The price of a normal hotel in Verona is the same as a palace in Brescia. The city of Verona is a UNESCO world heritage site. It gained its UNESCO status for its architecture and history. As you walk around the city you’ll see several Roman sites. The famous Roman Amphitheater and in addition, Roman gates and bridges. William Shakespeare, arguably the most famous author of all time has links to Verona. He wrote 3 plays based in Verona. Romeo and Juliet, The Two Gentlemen of Verona and The Taming of the Shrew. There are also many well kept Medieval buildings in Verona. Verona Arena was built in the 1st century. It used to host Roman games and circuses. It was so popular that people would travel from all over the Roman Empire to watch a live performance. Today the arena hosts live opera. It also hosts concerts, Adele and Paul McCartney have performed here before. Read about my experience in the Verona Arena. Castelvecchio translates into English as ‘old castle’. That’s exactly what it is, an old castle in the center of Verona. It was built under the reign of the Scaliger dynasty. They ruled Verona and parts of Italy towards the end the Medieval period. The castle is of Gothic architecture. The castle is built next to the river Adige. On a calm day you can take a beautiful reflection photograph of it. Today the castle houses the Castlevecchio museum (Italian). It’s free to walk around the castle grounds. Castelvecchio bridge connects the old castle to the north of Verona. This was constructed by the Scaliger dynasty as an escape route. A route they used when they were attacked from the south. The Scaliger dynasty escaped to Germany. More recently in the second world war, the bridge was destroyed. What you see today is a reconstruction. It was destroyed in 1945 and rebuilt in 1949. This Gothic bridge is a good location to take your Instagram photos. During Roman times, Market’s Square was a Roman forum. Things have changed a lot since then although there’s still a market here. The tallest tower in Verona, Lamberti Tower is located in the square (above). It’s 84 meters tall and the best place to go for a view of the city. Next to the tower is the Baroque style Maffei palace. In front of the palace is a Roman Madonna statue dating back to the 4th century. There are some buildings with frescoes in the square. These are the Mazzanti Houses. In the 15th century there were many painted houses like these. 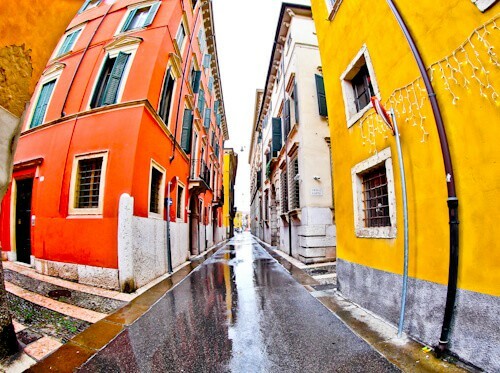 This resulted in Verona being nicknamed the painted city. Bra square is the largest square in Verona. It’s one of the most picturesque too. Several major landmarks are surrounding this square. 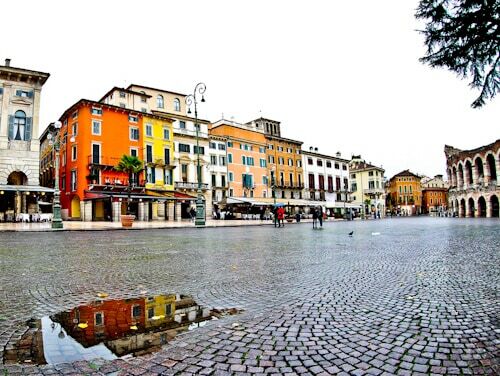 Verona Arena, Town Hall and the City Gates are located around Bra Square. You’ll see lots of colorful houses too. These often double up as cafes. Bra Square is a good location for people watching. We’ve all heard of Romeo and Juliet by William Shakespeare. Juliet’s balcony is part of a 13th century house. It’s where Romeo promised Juliet eternal love. Those visiting Verona as a couple come here for a romantic experience. For unmarried couples, it’s good luck to touch the statue of Juliet. You can ascend to the balcony for the ultimate Instagram photo! 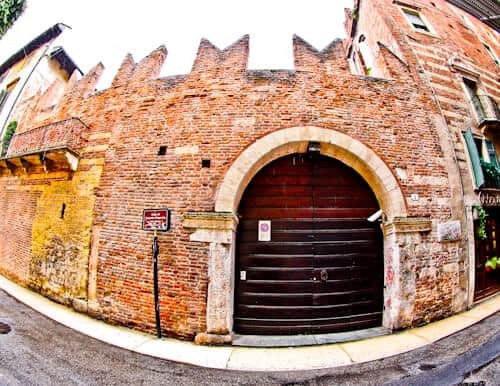 Fans of Romeo and Juliet may visit the house of Romeo. This is a private house so you can only photograph it from the outside. There’s an interesting plaque which reads, ‘Oh Romeo, Romeo, wherefore art thou Romeo?’. ‘Tut! I have lost myself, I am not here.’. Pietra bridge is known in English as Stone Bridge. It’s a Roman bridge which dates back to 100BC. This makes it over 2000 years old. Stone Bridge is the oldest bridge in Verona, also one of the oldest in Europe. 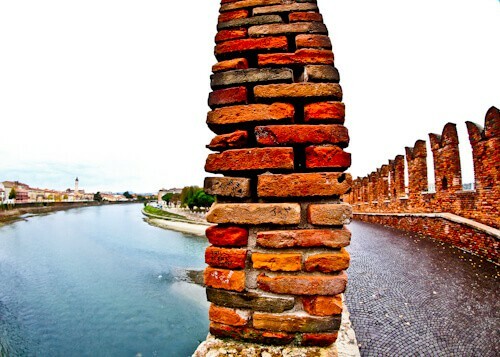 From the other side of the Adige river you can see the tallest tower in Verona, Lamberti Tower. Another tall structure is the Sant’Anastasia church. Perfect reflection photography is possible on days when the river is calm. 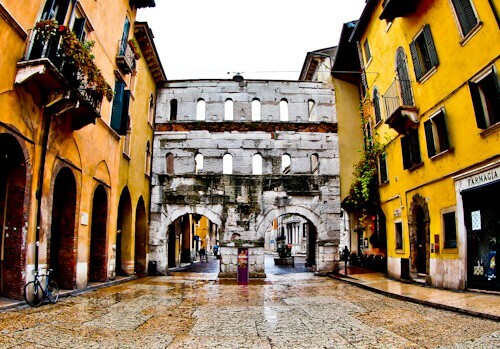 As you’re walking through the UNESCO streets of Verona you may come across a huge Roman gate. This is the Porta Borsari Roman Gate. It dates back to the 1st century. This gate was an entrance to the city during Roman times. 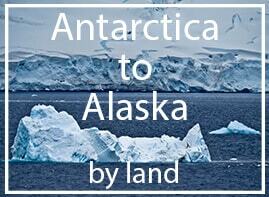 There are several nearby cities which you can make an easy day trip to. 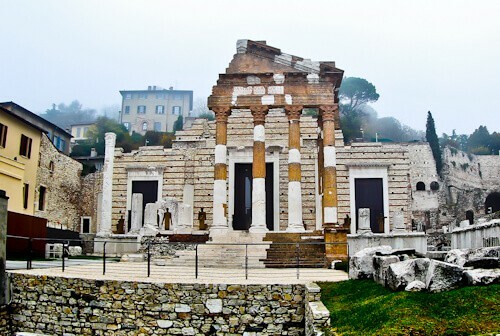 Brescia has its fair share of UNESCO sites. Lake Garda is one of the most beautiful lakes in Europe. Venice and Bologna are a short train or Flixbus ride away. Milan is a little further but still a rewarding destination. 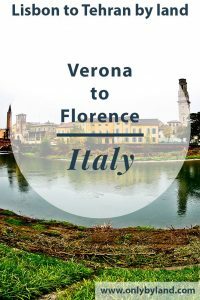 There are regular Flixbus services between Verona and Florence. The journey time is between 3-4 hours. There are several tunnels on this route as you pass through the northern Apennine mountains. You can plan your activities in Florence using the free on board WiFi. There’s plenty to see in Verona! I knew of Verona for Juliet’s balcony. It seems so full of Roman history too. The Roman gate on the streets is incredible! 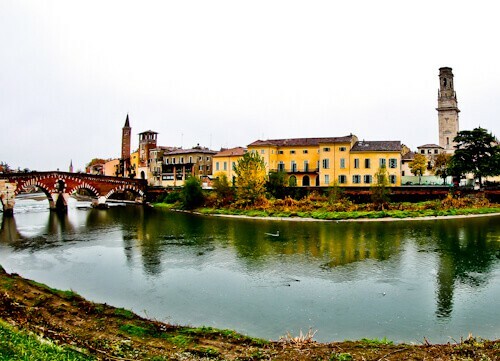 So much to do in Verona! Bra plaza looks like a good place for a coffee. People watching next to an Roman Amphitheater looks unique! 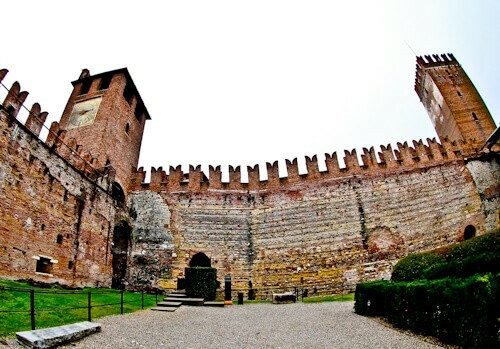 I was in Verona and loved Castelvecchio. I’m impressed at how you photographed Castelvecchio Bridge, it was packed when I went on it – no chance of a picture with no one in it! I love your picture of the colourful street too – I got some but in the sun! I had no idea the whole historic city Verona was a UNESCO site – it makes sense though when I see all the points of interest there! the Roman history is incredible. I’m into my Roman history man! The old market square that used to be a Roman Forum is so unique. I like the idea of the Roman Madonna statue more than the buildings with frescoes! you must definitely visit Verona then Graham! There’s probably a lot of Roman history I didn’t include as well. Enjoy! Hi James, I’m a huge William Shakespeare fan – I’ve been to his house in the UK. I had no idea about the Verona connection. This is why I’d visit Verona. 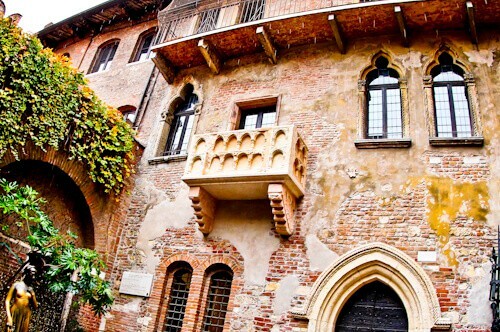 Did you know that the Juliet balcony is actually sold around the world in the same design as the original in Verona? I’m going to Florence first, I think I’ll take the Flixbus trip in reverse! I’ve never tried Flixbus before but you make it sound fun! I seriously have to consider the next time we go to Italy, that perhaps we drive there and then once there take buses between the different cities which will help reduce the cost on the toll roads! Seems it’s easy to get around Italy with FlixBus! Another awesome Italian city and love the history and connection to Romeo and Juliet. Definitely would be amazing to tick off. Also sounds like getting around by Flixbus is a smart idea! 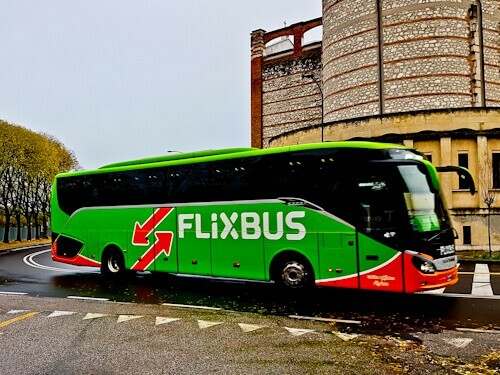 Hi Lexx, yes Flixbus is so convenient in Italy – and all over Europe! I’m impressed with your Italian, I wasn’t aware the Vecchio part of Castelvecchio meant old. I guess that works for the Ponte Vecchio in Florence too. Verona looks beautiful and I’d love to see an opera in the Arena. Fabulous pics as usual and another stunning Italian city. Hi Shona, don’t be calling any Italian guys vecchio when you visit! 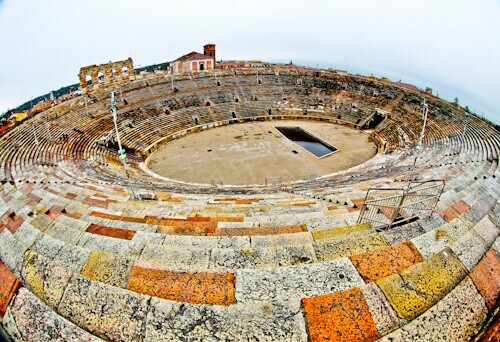 I’d love to visit Verona Arena, it looks just as impressive as the one in Rome! I had no idea about the history of Romeo and Juliet there either. This is a place I must take my girl! Well James Verona…. arghhh is my reaction when I hear about Verona!!! So about 10 years ago me and hubby were staying at lake Garda when we decided a day in Verona was necessary. So we jumped on a train and arrived at the train station to find Verona was having an almighty thunder storm so we stood at the train station at the torrential downpour and decided nope let’s do Venice instead. 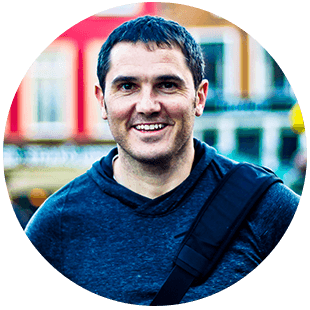 Fast forward to 2016 when I took a train trip around Italy – so naturally as we were travelling by train from Venice to Milan we added a stop in at Verona. 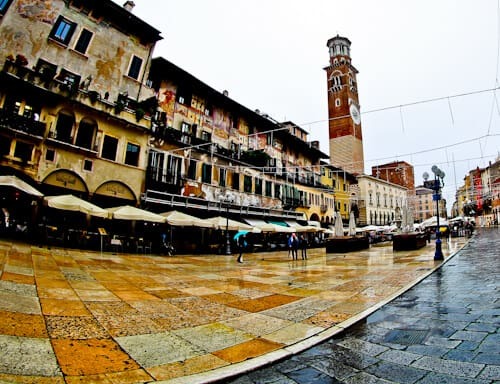 We arrived to ….. ANOTHER thunderstorm and torrential rain so once again I stood at the train station and peered out Verona…. Now my friends ask me to warn them when next I plan to go so they don’t book at the same time!! Verona Verona where art thou Verona???? Hi Tracy. It was raining pretty heavily when I was in Verona too! I remember my feet got soaked that day! If I didn’t plan on writing this post I’d have probably stayed indoors! Does it always rain in Verona ! ?